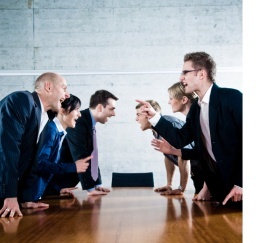 How much time do you waste dealing with disagreements within your team? And what’s this costing you in terms of your time management and the organisation’s profitability? Are you frustrated by the frequent distraction of niggling and persistent team issues that you thought had been dealt with? Do you often wonder why your team doesn’t just get on with their jobs? Are you in danger of losing really good and talented team members? What’s your team not telling you that’s negatively impacting efficiency and your bottom line? In every Australian workplace, approximately 25% of the staff are engaged, 25% are actively disengaged and the other 50% are just doing enough to keep out of trouble. Workplace absences cost on average $3,741 per employee per year (2010). Dept of Labour statistics show 46% of voluntary resignations are a result of an employee not feeling valued. Staff turnover rates are on the rise, with the cost of replacing an employee between 75 and 250% of their annual salary. Research conducted by Econtech on behalf of Medibank Private (2008) stated that office politics, competition, conflicts, poor relationships with superiors and bullying/harassment are all contributors to workplace stress – costing employers $10.11 billion per year and 3.2 days lost per worker per year. The Productivity Commission states the negative cost implications of workplace bullying include decreased productivity, low workplace morale, mental health issues, increased workers’ compensation claims, absenteeism, investigation costs, legal costs and reputational damage. Believe me, I understand your dilemma. Prior to establishing my own company 24 years ago, I held 3 senior management positions with between 5 and 17 people reporting directly to me. As my team’s lack of cooperation, gossip and poor communication increased, so did my work hours and stress levels. I searched long and hard for a remedy that provided genuine, sustainable results. Yet all I could find were 1 and 2-day ‘Team Building’ programs that were no more than a short-term shot-in-the-arm of motivation that quickly dissipated when we returned to our real world of work. It became my mission to build the solution to the problem of ‘difficult teams’, More than 2 decades of research, training, learning and experience has resulted in a unique program that’s guaranteed to enable you to not only lead but transform your team – from Floundering or Struggling to Performing and Excelling. Question: So how long is a program that can deliver all that? I understand the pressures of business and the challenge of spending 3 days away from the office. So I’ve distilled the key foundations of this program into a 3-hour seminar. It’s not a glossy overview or high-level theoretical presentation. You will leave with practical, immediately implementable tools that will assist you in getting ‘the unsaid’ SAID and begin to get your team on the right track. You will be able to more effectively lead, motivate and bring out the best in your team. That’s my promise. The first step must be about understanding. The late Stephen Covey wisely taught this as one of the 7 Habits of Highly Effective People – Seek first to understand, then to be understood. How well do you know you? When was the last time you took stock of your values, beliefs and attitudes? How well are you managing your time and energy – and how do you re-charge yourself? You may see yourself as decisive, knowledgeable and organized. But what if your team sees you, instead, as pig-headed, arrogant and rigid? I know that isn’t pleasant to hear or consider … looking in the mirror often isn’t. Mapping out where you see your team members fitting in terms of their personalities and behaviours will give you clarity as to how you can most effectively manage, lead and transform their performance. I’ve yet to meet anyone who truly and deeply loves conflict. Over the years, we all develop a variety of skills to deal with this in our lives, including avoidance, assertion of power and authority, coercion and compromise. There are other alternatives! Masterful questioning enables us to avoid assumptions and get to the heart of a problem quickly. And we need to learn how to acknowledge both what someone is saying as well as the emotion behind their message to create honest connection, rapport and respect. You and your team members are ‘whole’ people. Sure, we can take on a role when we arrive at work, but we are still a human being with needs, wants and challenges in our lives. Lets’ learn how to look after ourselves and others as complete human beings. We guarantee you will see, hear and experience measurable results! How to give Effective Feedback - and have those difficult conversations! Download the complete Seminar Flyer with the link below. Download the Seminar Registration Form here. We look forward to seeing you soon at this break-through seminar!